Warner Bros. Home Entertainment is clearly expanding, and now bought Turbine, the developer responsible for Asheron's Call, Asheron's Call 2: Fallen Kings, Dungeon & Dragons Online: Eberron Unlimited and The Lord of the Rings Online. Turbine was founded in 1994 and is one of the most famous MMO game developers. 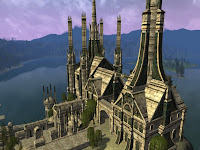 Warner owns the rights to other games based on Tolkien's books, and this may be the contributing factor for acquiring the Lord of the Rings Online developer. Warner Bros already bought developers Travellers Tales, Snowblind, Surreal Software, Monolith Productions and most recently Rocksteady, developers of the acclaimed Batman: Arkham Asylum.